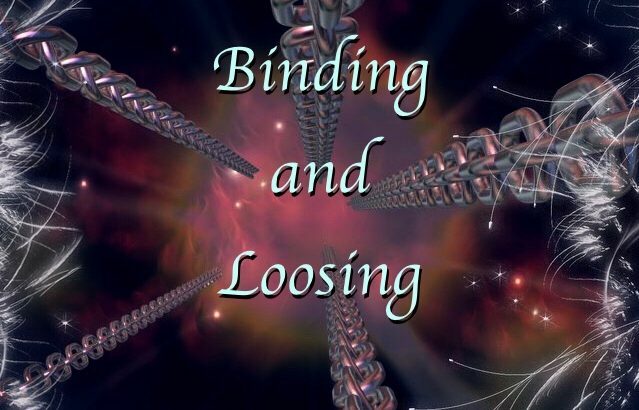 Many are confused on the term Binding and Loosing, and because of that they do not use this powerful tool at all, or use it incorrectly. The reason for this in part is because of not understanding the verses, and the fact that the biblical meanings of loosing and binding words themselves have been mistranslated in most English versions of scripture. Why was it mistranslated? That is very simple in that versions such as King James was translated from Greek to Latin to English and they had very little contextual context of the Hebrew culture to base the translation of words on. The Hebrew and Aramaic language was and is a hermetic language, and the same word can mean different things depending on the cultural context. The most common versus used for binding and loosing are Matthew 16:19 and 18:18. Historically Binding” and “loosing” were common terms used by the Rabbis in biblical times and was commonly used in time of Christ. When the rabbis “bound” something, they “forbade” it, and when they “loosed” something, they “permitted” it. In Jewish writings binding and loosing referred to “forbidding” or “permitting” something, and they were used for things, like rules and regulations, not people. The rabbis did not bind or loose people. “Binding” (forbidding) and “loosing” (permitting) were necessary because the Law of Moses could not contain all the regulations necessary to govern a congregation and society. Because of this religious leaders were required to “bind” and “loose” activities in the congregation that were not specifically included in the Law of Moses. This was true in Jesus’ day, and is still true today. The New Testament clearly teaches that any blood bought believer has power over demons, but at no time in the New Testament does anyone ever “bind” or “loose” a demon. Remember, in the culture, binding and loosing referred to THINGS, not people, and not demons, but. BUT when we bind or loose a “principle truth” of who Jesus is and what he about it becomes as law in Heaven, this principle covers all of the demonic realm. Let’s look now at the modern definitions of Bind and Loose so we can better see how these verses apply to us in this day and age. LOOSE to…. free, liberate, release, detached, loosen, unattached, liberate, disengaged, let go, open, unbound, untie, set free, unbind, unleashed, unlock, forgive or free. HOW BINDING AND LOOSING WORKS. When we use Prayer and Confession we BIND (see definitions) the spiritual realm law of Gods Ruach words of scripture to ourselves and others. When we use Prayer and Confession we can LOOSE (see definitions) ourselves and others from the works of darkness and we LOOSE (see definitions) ourselves by standing on our authority. Prophetic, Religion binding, binding and loosing, christian, deliverance, devotion, ministry, prophetic, religion, ruach. permalink.